On this Friday Playoff edition of the Subway Fresh Take, we’ll recap first round playoff action from Class 6A, 5A, 4A Divisions I & II, and Class 2-1A. Lawrence 56, Shawnee Mission North 32 – Lawrence produced 560 yards of total offense in a 56-32 shootout win over Shawnee Mission North. J.D. Woods rushed for 186 yards and four touchdowns on 18 attempts. Alan Clothier passed for 199 yards and two touchdowns for the Lions. Will Schneider led SM North with 323 passing yards and three touchdowns. Schneider also rushed for 120 yards and a score. Blue Valley 37, Shawnee Mission West 14 – Blue Valley scored the game’s final 23 points to knock off Shawnee Mission West, 37-14. The Tigers and Vikings were tied at 14 in the second quarter before William Evans scored to give Blue Valley a 21-14 lead at halftime. Quarterback Colton McCumber and Evans each added touchdowns in the second half and the Tiger defense got a safety to pull away. Shawnee Mission East 49, Blue Valley Northwest 13 – Blue Valley Northwest trailed defending champion Shawnee Mission East 14-13 in the first quarter before the Lancers pulled away. East led 21-13 at the break before scoring 28 points in the second half. Olathe North 35, Blue Valley North 28 – Olathe North outscored Blue Valley North 14-0 in the second half to pull out a 35-28 win. Blue Valley North led 28-21 at the break on a great first half from their senior quarterback Joey Dolan. Dolan passed for 244 yards and three scores before leaving the game in the third quarter with an injury to his hand. The Mustangs were unable to score without Dolan. Vinnie Shabazz led Olathe North with 196 yards and two touchdowns on 34 carries. Matt Wright passed for 181 yards and two scores for the Eagles. Isaiah Simmons caught three passes for 161 yards and both touchdowns. Blue Valley North had two 100-yard receivers in Sam Shortall and Alex Blake. Wichita Northwest 55, Wichita North 19 – Northwest rolled over one-win Wichita North 55-19. The Grizzlies led 45-7 at halftime. Jahlyl Rounds rushed for a game-high 212 yards and a touchdown on 16 attempts for the Grizzlies. Rounds also caught a touchdown pass from Jacob Deveraux. Kevin Folsom passed for 206 yards and three scores for Northwest. Martese Mullins caught six for 130 yards and two scores, while Alex Bott added four catches for 102 yards and a touchdown. Lawrence Free State 49, Wichita West 0 – Free State built a 28-0 halftime lead behind two Sam Skwarlo rushing touchdowns and his touchdown catch from Bryce Torneden. Skwarlo added another long touchdown run to begin the third quarter as Free State rolled to the victory. He rushed for 168 yards, while Torneden passed for 182 yards and two scores. Derby 52, Topeka High 21 – Derby exploded for 31 points in the second quarter in racing past Topeka High, 52-21. The Panthers led 38-7 at halftime behind three Brady Rust rushing touchdowns and Rust’s two touchdown passes to Kai Lemons. Rust rushed for 131 yards and passed for 227 yards and three touchdowns. Lemons’ two touchdown catches spanned 110 yards. Topeka High back Mike McCoy rushed for 141 yards and a touchdown in the loss. Junction City 56, Hutchinson 21 – Junction City exploded for 28 points in the second quarter to pull away from Hutchinson in a 56-21 win. The Blue Jays rushed for more than 400 yards on the night thanks to big games from Jovon Baldwin and Raye Wilson. Baldwin rushed for 149 yards and three touchdowns, while Wilson added 171 yards rushing and four touchdowns. Wilson also caught a touchdown pass among two catches for 59 yards. Mill Valley 49, Leavenworth 0 – Top-ranked Mill Valley scored 28 points in the first quarter in putting away two-win Leavenworth. Logan Koch tossed a pair of early touchdown passes and rushed for another score. Christian Jegen broke an 80-yard touchdown run and caught two touchdown passes from Koch on the night. Pittsburg 49, Shawnee Heights 0 – Pittsburg had little trouble winning at Shawnee Heights. Sherrick Rogers rushed for two touchdowns, while Zack Roark and Adrian Scroggins each scored rushing touchdowns. St. Thomas Aquinas 55, Topeka Seaman 21 – Aquinas cruised to a 55-21 win over Topeka Seaman. James Cosentino rushed for a pair of touchdowns for the Saints. Duron Lowe opened the scoring with a 29-yard touchdown run, and later added a touchdown reception from Karter Odermann. St. James Academy 41, Lansing 20 – St. James Academy picked up the school’s first-ever playoff win by beating Lansing, 41-20. Lansing led 7-0 after one quarter thanks to a Quinton McQuillan touchdown run. The Thunder would answer with three consecutive touchdowns and take a 20-13 lead into halftime. St. James would expand their lead to 27-13 after three quarters and hold off the Lions. Bishop Carroll 31, Salina South 14 – Bishop Carroll quarterback Jake Allen left the game in the second quarter, but backup Cannon Lynch broke two long touchdown runs to lead the Eagles past Salina South. After the Cougars tied the game at 14 in the third quarter, Lynch broke a 68-yard touchdown run to give Carroll the lead for good. Wichita Heights 41, Goddard 27 – Blake Sullivan broke two long touchdown runs to put Goddard up 13-0 early, but Heights outscored the Lions 41-14 the rest of the way to win 41-27. Rodney Murphy rushed for 158 yards and three touchdowns for the Falcons, while DeJaun Scott added 164 yards on the ground and two scores. Sullivan, just a sophomore, ended with 184 yards rushing and 149 passing for Goddard. Maize South 26, Great Bend 14 – Korie Frausto rushed for 200 yards and scored two touchdowns to help Maize South win at Great Bend. The Mavericks overcame four turnovers to win by 12 points. Jordan Maxson added 110 yards and a score for Maize South. Goddard-Eisenhower 20, Kapaun Mt. Carmel 14 – Eisenhower picked up the first playoff win in school history by beating Kapaun Mt. Carmel 20-14. Mason Madzey tossed a short touchdown pass to Kyle McGreevy in the fourth quarter to break a 14-14 tie and lift the Tigers to the win. Alexander Norris rushed for 125 yards and a touchdown for Kapaun, while quarterback Brock Monty completed just 7 of 19 passes for 97 yards and was intercepted twice. Basehor-Linwood 41, Louisburg 34 – Basehor-Linwood built a 20-7 lead before Louisburg came storming back in the second half to tie the game at 20. The Bobcats and Wildcats traded touchdowns, but Louisburg’s two-point attempt failed leaving Basehor-Linwood with a 27-26 lead. Thomas San Augustin then scored to give Louisburg a 34-27 lead with nine minutes remaining. Austin Ettinger then scored for Basehor-Linwood with five minutes remaining to tie the game a t 34. After a Louisburg interception, Justin Phillips hit Jahron McPherson on a touchdown pass to lift the Bobcats to the win. Eudora 33, Fort Scott 7 – Grant Elston rushed for 227 yards and a touchdown as Eudora bested Fort Scott, 33-7. Elston also completed all three of his passes for 45 yards and a touchdown. Bishop Miege 61, KC Piper 12 – Defending champion Bishop Miege built a 54-0 halftime lead in rolling to a first-round win over KC Piper. The Stags scored 21 points in the first quarter and 33 more in the second to top the Pirates. Paola 38, De Soto 21 – Paola avenged its only loss of the season by beating De Soto 38-21 on Friday. Dalton Rankin rushed for three touchdowns to lead the Panthers. 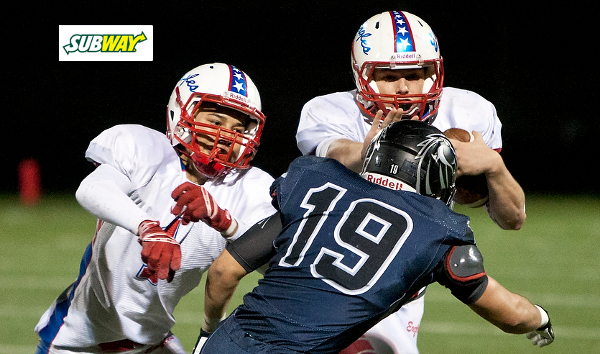 Nate Thompson threw a pair of touchdown passes to Sam Regneir to keep De Soto close. The Wildcats defeated Paola 23-7 back in Week 2. Andover Central 47, Independence 21 – Andover Central jumped out to a 33-7 halftime lead on Independence and cruised to a 47-21 win. Quarterback Peyton Huslip passed for 268 yards and three touchdowns to lead the Jaguars. Darraja Parnell had 116 receiving yards and two sores, and returned an interception and kickoff for touchdowns. Abilene 43, Ulysses 38 – Abilene scored the final 14 points to pick up a 43-38 road-win at Ulysses. Harley Hazlett rushed for 108 yards and three touchdowns and passed for 145 more yards for the Cowboys. Ulysses led 30-29 at halftime and 38-29 after an Ian Rudzik touchdown run in the third quarter. Abilene got a Trey Bender touchdown in the fourth quarter to pull within 38-37, then Hazlett put the Cowboys ahead for good with an 11-yard run with four minutes left. Rudzik rushed for 224 yards and four touchdowns and returned a kickoff 95 yards for the Tigers’ fifth score. Rudzik appeared to break a long touchdown run in the first half, but Hazlett chased him down and poked the ball out free at the goal line. Officials ruled it was a fumble giving Abilene the ball. Topeka Hayden 21, Augusta 0 – Hayden scored two touchdowns in the fourth quarter to pull away from Augusta in a 21-0 win. The Wildcats struggled with penalties for much of the game and led 6-0 before quarterback Dallas Crittenden tossed a touchdown pass to Mason Dodd for a 14-0 lead. Connor Schumacher then broke a long touchdown run to complete the scoring. Schumacher led Hayden with 145 rushing yards. The Wildcats held Augusta to just 1 yard rushing on the night. Holton 35, Osawatomie 12 – Holton scored in every quarter to eliminate Osawatomie for the second consecutive season. Will Wright scored two touchdowns for the Wildcats, while Justin Pool and Mason Barta added rushing scores. Frontenac 38, Girard 6 – Brandon Mlekus rushed for 105 yards and two touchdowns to lead Frontenac past Girard for a second time this season. Cadin Bolinger added 98 yards rushing and another score for the Raiders. Mlekus also passed for 143 yards in the game. Santa Fe Trail 35, Jefferson West 22 – Santa Fe Trail built a 20-8 lead only to see Jefferson West mount a comeback. The Tigers Quinton Guerra scored on a short touchdown run, then caught a touchdown pass from Hunter Dean to put Jeff West up 22-20 in the third quarter. The Chargers would score twice in the fourth quarter to win 35-22. Gage Greenfield returned a Jefferson West interception for a touchdown to put Santa Fe Trail up 28-22. Another interception led to a Bryce Erickson touchdown run to seal the win for the Chargers. Columbus 55, Anderson County 7 – Columbus rolled past Anderson County to move to the state quarterfinals. Trey Robinson passed for 219 yards and three touchdowns, including connections with JaVohn Morrill for 106 yards and two scores. Jace McDown added 120 rushing yards and two score in this one. Andale 60, Nickerson 45 – Defending champion Andale scored 26 points in the first quarter and had to keep scoring to hold off upset-minded Nickerson, 60-45. The Indians led 39-25 at halftime before Nickerson pulled to as close as 39-37. Taylor Richter scored to put the Indians back up 46-37, and Andale came down with an interception on Nickerson’s next possession. Zach Meyer rushed for 148 yards and three touchdowns to lead the Indians. Richter added 180 yards on the ground. Andale rushed for 396 yards, while Nickerson totaled 533 yards of total offense. Hugoton 20, Colby 14 – Hugoton scored 20 unanswered points to escape Colby with a 20-14 win. The game was scoreless at halftime before Colby took a 14-0 lead in the third quarter. The win propels Hugoton into the state quarterfinals against Andale. It was Hugoton’s second win over Colby this season after beating the Eagles 27-8 back in Week 3. Wamego 28, Clearwater 27 –Wamego rallied from down 27-7 in the fourth quarter to slip pat Clearwater 28-27 at home. Clearwater led 20-0 at halftime before the teams traded touchdowns in the third quarter. In the final period, Wamego quarterback Dillon Blain connected with Jayson Ebert on three touchdown passes including the go-ahead score with 1:33 remaining. Holcomb 48, Concordia 0 – Holcomb rolled to a 48-0 shutout of Concordia in the first round. The Longhorns scored on their first five drives of the first half in building a 35-0 lead. Dillon Williams rushed for more than 100 yards in the first half for Holcomb. Troy 67, Wabaunsee 20 – Troy scored 32 points in the first quarter and led Wabaunsee 54-20 at halftime. Reid Greaser threw two touchdown passes to Chris Winkel and another to Cuttar Huss as the Trojans cruised to victory. Winkel and Huss each rushed for touchdowns and Kortin Blevins added two more rushing touchdowns. Lyndon 48, Mission Valley 32 – Dexton Swinehart rushed for 292 yards and two touchdowns as Lyndon avenged an early-season loss by beating Mission Valley, 48-32. Swinehart also caught a touchdown pass and threw a scoring strike to Nick Ratzloff. Clay Phillips rushed for 178 yards and three scores for the Vikings. Jackson Heights 24, Jefferson Co. North 14 – Brady Holliday rushed for 160 yards and a touchdown as Jackson Heights beat Jeff County North. The Cobras led 16-14 at halftime taking advantage of both two-point conversion attempts. Olpe 35, Northern Heights 6 – Defending champion Olpe topped Northern Heights 35-6 to advance to the 2-1A quarterfinals. Ryker Schmidt rushed for two touchdowns and threw two touchdown passes to lead the Eagles. Dylan Redeker and Andrew Burenheide each rushed for more than 100 yards for the Eagles. Smith Center 48, Sedgwick 21 – Second-ranked Sedgwick never could slow down Smith Center’s rushing attack as the No. 4 Redmen won 48-21. Smith Center’s Cale Rogers rushed for 245 yards and three touchdowns in the game. Chase Ryan added 87 rushing yards and three more scores for the Redmen. Oakley 45, Syracuse 6 – Oakley’s Auston Holzmeister returned the opening kickoff for a touchdown as the Plainsmen rolled to a 45-6 win over Syracuse. Macoy Rains rushed for 80 yards and a touchdown, and returned an interception for another score. Phillipsburg 38, Sacred Heart 13 – Phillipsburg led Sacred Heart just 12-6 at halftime, but pulled away for a 38-13 victory. Kirk Coomes rushed for three touchdowns to lead the Panthers. Meade 42, Ellis 14 – Ellis and top-ranked Meade traded touchdowns in the second quarter before the Buffaloes took a 21-14 lead into halftime a Lawson Luetters touchdown. Luetters added a pair of touchdown runs in the third quarter as the Buffs built a 35-14 lead. Meade will host Phillipsburg next week.